What flies through the night sky in Israel’s greatest city? Bats. Lots and lots of them. Tel Aviv likes to appropriate New York’s claim to be “the city that never sleeps,” and, indeed, during the interminable humidity of the notorious July/August heat, it does seem that Tel Aviv is as alive at night as it is during the day. It becomes a fantasia of streetlights, bicycles, cafes, bars, parks, and thoroughfares filled with people under a purple sky. At such times, the cacophony of Tel Aviv’s famous night life seems like a tribute to man’s ability to rule over nature and time itself. The city has no night and no day; life, power, and light have been successfully coaxed from the unforgiving red sand beneath its streets. But while man may rule the Tel Aviv of the day, the Tel Aviv of the night is the domain of something very different. It is utterly non-human, and quite unlike anything else on earth. Just above the heads of the unsuspecting revelers there is another night life. Man may rule the sidewalks, but something else rules the sky—for nine months of the year, the bats are the lords of the Tel Aviv night. It is easy to forget that a city is an ecosystem just as much as a forest or a jungle; a city simply happens to have been forged by human beings rather than nature. Tel Aviv is no exception. Indeed, the long months of heat lend themselves to bursts of fertility unknown in colder climes. The diversity of urban wildlife is extraordinary: Swans and herons cruise the Yarkon River, disturbingly large cockroaches swarm around garbage cans and crouch in dark corners, hedgehogs and porcupines make their amiable way through parks and across streets, tiny lizards skitter up walls and occasionally turn up in your shower. There is even the rare visit from a shark or dolphin. And, of course, there are the ubiquitous pigeons nesting on every available horizontal surface, echoing their origins as cliff-dwelling doves. Then there is the ancient desert animal that has lived in a symbiotic relationship with humans for millennia, worshipped as a god by the ancient Egyptians and prized for its skill at hunting vermin—felis catus, the common domestic cat. Like almost every other city in Israel, it sometimes seems as if Tel Aviv is entirely populated by feral cats, lounging everywhere from stairwells to the roofs of cars. And however mangy they may be, they never quite lose their inscrutable charm, or the city’s sincere gratitude for keeping the rodent population at a relative minimum. 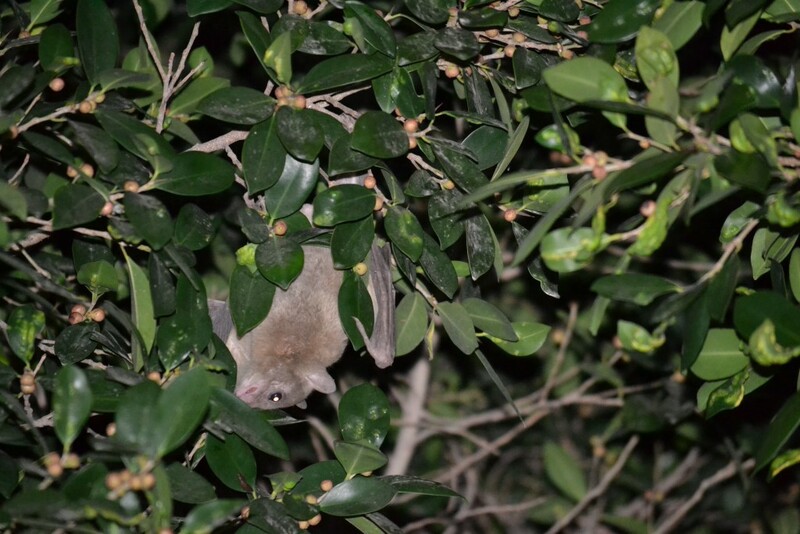 Yet there is no doubt that the bat is the most unusual of Tel Aviv’s indigenous fauna. In most places, bat sightings are rare, and almost unheard of in urban areas. The reasons are obvious: They are darkly colored, travel by night, make little noise outside their dens, and are often small. With the exception of a famous bridge in Austin, Texas, their nesting places are usually concealed and inaccessible, and residents rarely glimpse them in large numbers. Every night, they flit among the palm trees, burst forth from abandoned buildings, swirl around the streetlights, and fill the avenues of central Tel Aviv with the silence of their muffled wings. But in Tel Aviv, they come in their thousands. Every night they flit among the palm trees, burst forth from abandoned buildings, swirl around the streetlights, and fill the avenues of central Tel Aviv with the silence of their muffled wings, indifferent to the crush of activity a few meters below. Everywhere you go, it sometimes seems, they are there; and one cannot help feeling that, when the sun goes down, you might be there too, but they are the ones in charge. After all, you are up past your bedtime. They are where they belong. Perhaps the best place to see them in action is on a summer night along Rothschild Boulevard, Tel Aviv’s most fashionable and expensive thoroughfare. As merrymakers, families, and passerby go up and down the wide pedestrian boulevard, clouds of bats crisscross the air above them. They are here for a primal reason—to feed. Various bat species consume everything from insects to fish to animal blood; but the bats of Tel Aviv are, for the most part, a very specific fruit-eating species, one as unique as the bat itself: They are Egyptian tomb bats, so named for their habit of nesting in ancient Egyptian tombs. Their appetite often seems insatiable, and during the long summer, Rothschild Boulevard is lined with trees bursting with dates. It is, in other words, a bat paradise. Sometimes so fast you can barely see them, the bats circle, dive, effortlessly grasp a branch, and hanging upside down—as they always do when not in flight—twist off a date with their small, vestigial claws and devour it almost whole, spitting out the remaining pulp and seeds before departing as quickly as they came. This alone is enough to convince you of the animal’s stunningly precise adaptation to its artificial ecosystem. But that is not the most striking thing about them. There are two kinds of bats—microbats and megabats. Microbats, as their name suggests, are small; they feed almost exclusively on insects, and have extremely bad eyesight. They famously navigate by echolocation, sending out a series of clicks that their sensitive ears then translate into a sound-picture of their environment—a natural equivalent of sonar or radar. Megabats, on the other hand, are often large, do not use echolocation, and have massive eyes perfectly adapted to seeing and hunting at night. And their prey, needless to say, is much larger than insects. I once saw five flying foxes—the largest bats on earth—in the Jerusalem Biblical Zoo. It was a blazingly hot day and, hanging upside down, they flapped their enormous wings to cool themselves. They were the size of a small dog with eyes as big as cherries. I do not wish to speculate on their wingspan, but some specimens have been measured at five feet. The Egyptian tomb bat, however, is a bizarre form of microbat, or megabat, or both, or neither. They are more or less middle-sized, roughly as big as a small hamster. Like microbats, they make prodigious use of echolocation. Like megabats, they have large eyes excellent at seeing in the dark and do not feed on insects. They are, in other words, a highly unusual member of a highly unusual species. They are also very, very unlike our typical idea of bats. On a Rothschild night, if you are lucky, one of them will alight on a low branch beneath a streetlight, and stay long enough for you to get a good look at it. Once, a girlfriend and I watched one feeding. It spat out the seeds, then turned around and looked right at us. In those large round eyes was an unmistakable intelligence and distinctly friendly awareness, utterly without fear or aggression. The bat seemed, in fact, to be as curious about us as we were about it. It was also something that could only be called, of all things, cute. With its long, tapering snout, its face resembled that of a miniature dachshund; its fur was more a soft dark-gray than black; its head was topped with the most extraordinary pair of ears I have ever seen. Small, triangular, and highly mobile, they resembled the ears of a tabby cat, but they were moving from side to side with blinding speed, sometimes so fast they were almost a blur. This bat was not, as the saying goes, blind. In fact, it had double sight. Its eyes could see quite well, but its ears even better, taking in every hint of sound within a 360-degree radius. Here was an animal completely at home in a world with or without light. It was aware of its surroundings in a way you and I never will be. And yet, there was also something playful in those ever-shifting ears, like a dog wagging its tail or a whale sounding through the waves. This strange creature seemed, for a moment, to be enjoying itself. And there is something else you realize when you see a bat up close, perhaps the most unexpected thing of all. As it moves, its back ripples with muscles, the flesh seeming to stretch almost to breaking point. And you suddenly realize that, despite its diminutive size, this is a powerful animal. Then, as in most things to do with bats, you wonder why you never thought of it before. It makes, after all, perfect sense: What strength it must require to power those wings, to propel that small body through the night sky. That bats are completely unique is not romantic blubbering. It is scientific fact. As any competent zoologist will tell you, there is nothing on Earth quite like the bat. This may be the reason it is also one of the most misunderstood creatures that has ever existed. 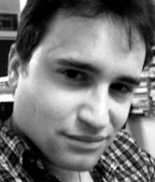 Perhaps because it is a mammal that flies, when mammals—we think—should not fly; perhaps because it is a nocturnal creature, and humans have always feared the night; perhaps because from afar they resemble flying rats; perhaps because of simple bad luck; people have hated and feared bats for centuries. At various times, they have been demons, vampires, witches’ familiars, and general all-purpose residents of gothic castles and haunted houses. Needless to say, they are never on the side of the angels. These stereotypes are not simply untrue, but the polar opposite of the truth. Bats are, in fact, completely harmless to humans. Their ability to fly and navigate in the dark is a result of natural evolutionary forces, not supernatural evil. And they are certainly not rodents of any kind. Their closest—albeit very distant—relative was probably a primitive tree-dwelling primate. Unfortunately, the effort required to dispel this plethora of myths and nonsense often makes it hard to fully convey just how extraordinary this animal actually is. That bats can fly barely scratches the surface of what makes them unique. They are, of course, the only flying mammal. That is, they come from the same family as we do. Somewhere back in the mists of prehistoric time, we share a common ancestor. Like us, they are warm-blooded, grow fur, give birth to live young, feed them with milk, and care for them until they are able to fend for themselves. But while we have remained on earth and other mammals have taken to the sea, only the bat has conquered the sky. At some point millions of years in the past, this creature diverged from the evolutionary path of every other mammal that has ever lived, and flew away. This evolutionary process is equally extraordinary, because the process by which bats developed flight is also completely unique. Bats may be the only animal besides birds or insects capable of true flight, but that true flight is nothing like that of birds or insects. 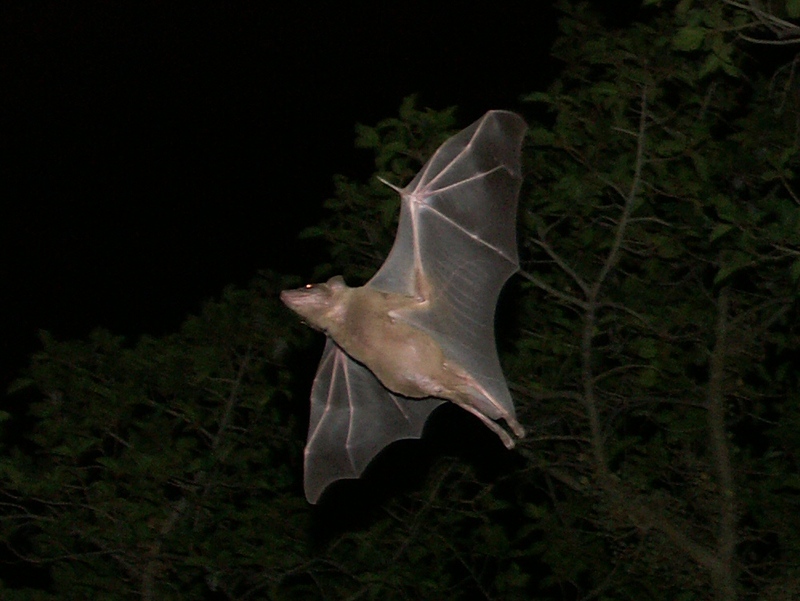 Due to their independent evolutionary development, bats fly in a completely different way than any other flying animal. And the result is that they are not simply fliers. They are extraordinary fliers. The reason why is to be found in their own mammalian ancestry. Unlike those of birds or insects, a bat wing is essentially a massively elongated hand with skin stretched between the digits. Whereas other flying animals flap their wings, bats sweep them up and down, their long “fingers” curving the wings in intricate and ever-changing patterns as they do so. As a result, the bat’s agility is astounding. It can, quite literally, stop on a dime. It can go full speed toward a stationary object and veer off seconds before impact, a trait much on display as one watches them flit effortlessly between the palm trees, never so much as glancing a single leaf. This agility has even begun to attract the attention of aviation engineers, who are investigating the possibilities of designing a vehicle based on the physics of bat flight, which they believe could be more maneuverable than current designs. For over a century, men have looked to birds in order to learn how to fly. Now, they have turned toward the bat. Yet the most stunning thing you can experience when encountering a Tel Aviv bat is not a sight but a sound. Particularly when they pass directly overhead, you can often hear a sharp, high-pitched whirring noise. I had to hear it several times before I realized what it was—the bat’s sonar. Any attempt to describe it is wholly inadequate. One could compare it to the ticking of a watch sped up a hundred times, the sound made when you run your fingers quickly through the teeth of a comb, the gears of an extremely small engine going at full speed, but none of these metaphors come close to capturing the sound of this mechanism through which the bat conceives of its entire world. It may be enough to simply know that, while you are hearing that sound, that sound is seeing you. There is something else that puts the lie to all the stereotypes about the bat. They are not only powerful and agile. They are also beautiful. And there is something else that puts the lie to all the stereotypes about the bat. They are not only powerful and agile. They are also beautiful. If you are very lucky, you may be able to catch a glimpse of a Tel Aviv bat at dusk or even late afternoon. You will realize to your surprise that the bat is not, in fact, gray or black. They are a gorgeous dark shade of magenta, an adaptation that undoubtedly helps them blend in with a night sky that is never as black as we imagine. I have never touched one, but I have read that their fur is extremely soft, close to the texture of velvet; and when their wings are placed in direct light, they are entirely translucent. Indeed, one of the most extraordinary images I have ever seen was a photograph of a bat fetus. It is like nothing else you will ever see. The bat lies in the amniotic sac wrapped in its own wings, its head tucked beneath their protection, its triangular tail folded up beneath it. It has not yet acquired its dark coloring, so this tiny creature in its white shroud seems to be encased in a chrysalis, kept safe from an earthbound existence, until that shroud spreads open and bears it upwards. This thing, you realize, even in its most protean form, belongs to the night sky. Like most Israelis, however, the bats haven’t had an easy time of it. The newly-born Jewish state was no more immune to the myths surrounding the bat than any other country; and in the 1950s, this ignorance had terrible consequences. Israeli farmers became convinced that bat colonies were doing serious harm to their crops, and with a poor and needy population of new immigrants to feed, the authorities felt they couldn’t take any chances. 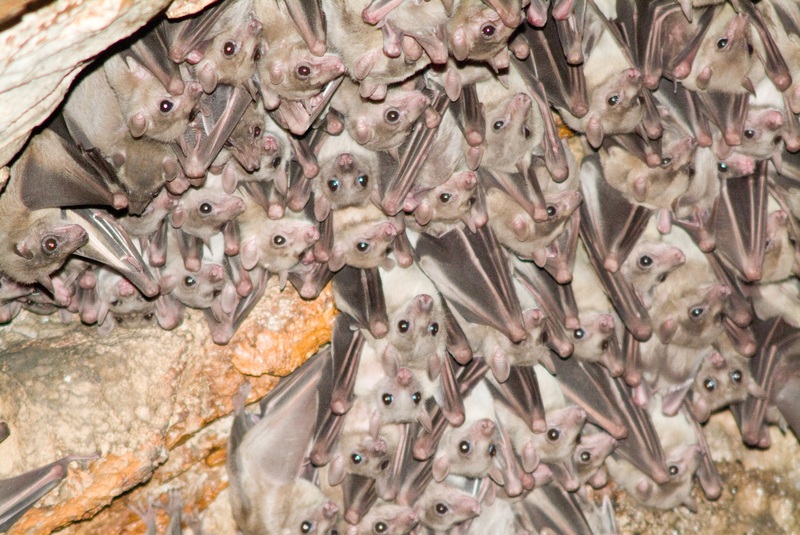 What followed was what Israeli zoologists somewhat melodramatically call “the bat Nakba.” Through a combination of poisons and quite literally throwing gas bombs into caves and other bat colonies, much of the bat population of Israel was devastated. As is usually the case with such things, the authorities eventually found that what they thought was a heroic battle against a dangerous pest was more a black comedy of errors. The bats they eradicated were, in fact, almost exclusively insectivores, and thus posed no danger whatsoever to agriculture. The insects they fed upon, however, certainly did; and deprived of their most powerful natural predator, these insects’ effect on crops became even more egregious. 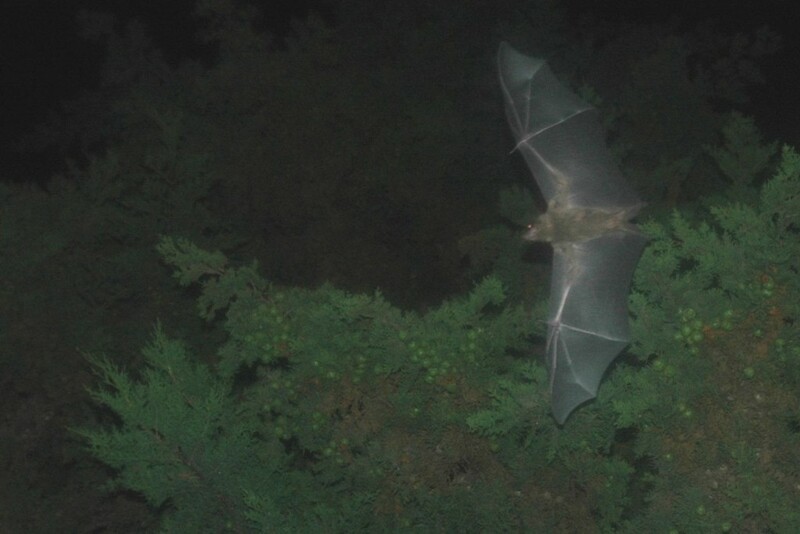 Fortunately, the efforts of Israeli zoologists and environmentalists have borne considerable fruit in recent years, as officials and farmers have realized the benefits of a symbiotic relationship with bats. Many colonies are now legally protected, and some have even been deliberately cultivated. I’m grateful for their efforts, because I’ve never lost the pleasure of observing the bats of Tel Aviv. I’ve seen them many times and in many places. Usually they are simply feeding among the date palms. But once, I saw one drinking from the fish pond in Rabin Square. To see a bat drink is a sight to behold. It flies low over a pool of water, skims the surface, and laps up the water with its tongue. It will do so several times before it is sated, circling back again and again on the same flight path with uncanny precision. And, of course, there was the time during the 2011 tent protests on Rothschild Boulevard when I passed a tent covered with bat droppings. It bore a sign saying, “This is a not a bat toilet!” I smiled and thought, “What are you going to do? They can fly. You can’t.” This is their city, I thought, you just live here. Perhaps my fascination stems from the fact that the Tel Aviv bats and I go back a long way. I discovered them for the first time as I was discovering Israel for the first time. On my first trip to Tel Aviv, I passed an abandoned building on the border with Jaffa. Out of its locked gate came an unholy shriek. It was dusk, so I was curious instead of frightened. I looked through the bars and saw only a dusty, once-white interior with buttresses painted black. It took me a few minutes to realize that the black paint was doing something it should not be doing—it was moving. Indeed, flecks of paint were breaking off and sailing toward the opposite wall. I realized what I should have realized immediately: Here was a colony of hundreds of bats, ravenously hungry, waking from their long day’s sleep; the wild shriek that had drawn me here was them celebrating the coming night. Ever since, I’ve kept my eye out for the bats, even feeling disappointment on the winter nights when they fail to appear. And perhaps this is the bat’s ultimate weapon. You can look at pictures, watch videos, and read books about them, but once you see them in real life, you’re hooked forever. And perhaps the flourishing of its bats says something about Tel Aviv itself. This young city, born out of the barren dunes, was always intended to foster a renewal and renaissance of its ancient people. And it has succeeded in doing so. But it has also inadvertently become a place that gives life to all its creatures. It is fertile and fecund, fostering the brilliance and beauty even of creatures despised and feared for centuries—much like the ancient people that built and maintain it. During the day, life bursts forth from the dust of the earth; and at night, it fills the sky. The bats of Tel Aviv, in their own way, are true Tel Avivians; like us, they have found a home in this young city, a city that feeds and sustains them, giving them new life, and the pleasures of night life in a city that never sleeps.